The three days of the Autumn Daze Festival will feature homemade crafts, foods, live entertainment and more. 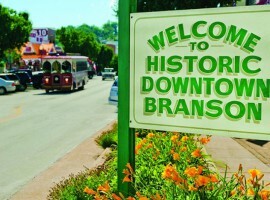 Artisans and crafters will exhibit their work during the 43rd Autumn Daze Arts, Crafts & Music Festival in Historic Downtown Branson Thursday - Saturday, Sept 15-17, 2016. Hours are Thursday & Friday 9AM to 6PM and Saturday 9AM to 4PM. The festival is free to the public. Throughout each day the entertainment stage will feature FREE live music from some of Branson's finest entertainers! Crafters and artists from many states around the country will participate. Shoppers will find a wide variety of items including wood crafts, quilts, clothing, crocheted and knitted items, jewelry, hats, purses, ladies' accessories, toys, floral arrangements, ironworks adn collectibles. Many vendors will be demonstrating their techniques! In addition to continuous entertainment adn homespun wares, Autumn Daze will also feature a food court, a celebrity autograph booth, a Downtown Branson sidewalk sale and more.